Here’s how I read this new poster from Ready.gov. Fifty percent increase in disasters in the past 10 years? Government incentives to have a disaster declared and more, in everyone’s interest. But the number of people who actually participate in this idiotic and no doubt expensive government pep-rally is tiny. 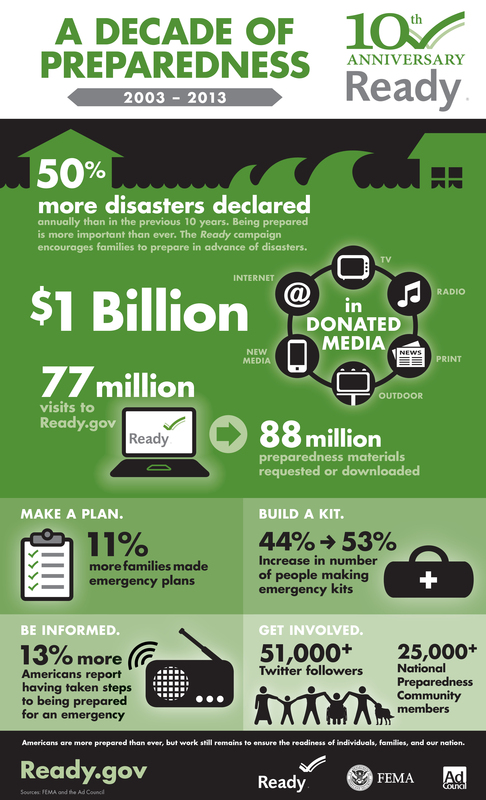 The only real statistic here is the claim that more than half of Americans have prepared emergency kits. I don’t know whether that’s true but it is an indicator of a lack of public confidence in government’s ability to deal with disaster. So as a self-help program, I guess the government telling everyone that they are on their own is working. Want to understand the manufacture of fear and obedience in America? Read my new book, American Coup: How A Terrified Government is Destroying the Constitution.